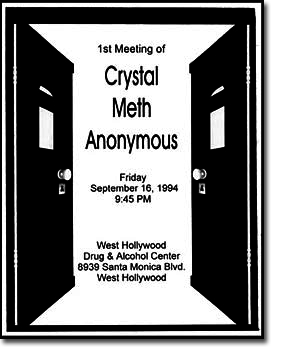 Attended by 13 people, the first meeting of Crystal Meth Anonymous was held September 16th, 1994, at 9:45 pm at the West Hollywood Alcohol and Drug Center in West Hollywood, California. The speaker at that meeting was Don N. (who, by no coincidence, returned as the keynote speaker fourteen years later at CMA's first General Services Conference at Park City, Utah). As of 2013, this General Service web site lists nearly 600 meetings in 47 states and provinces in 4 countries.